Please welcome the ever-fabulous Elizabeth, who comes to us today with her very first guest post! 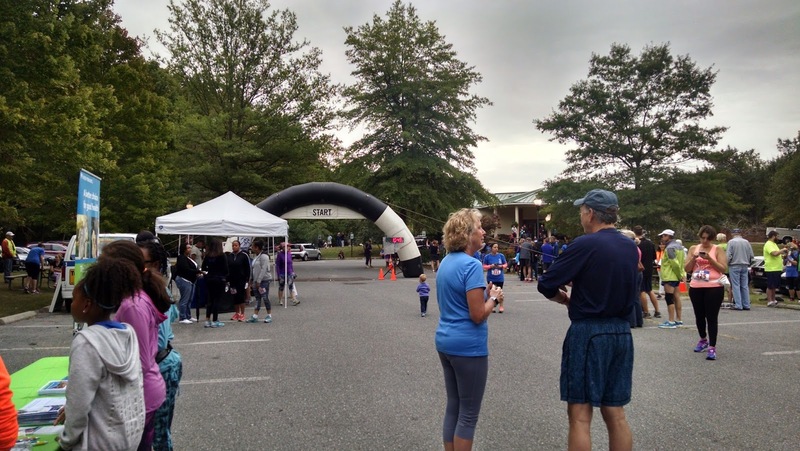 She ran the Annapolis Run for the Light House 5K last weekend. Here's her take. So I'm new to this whole recap thing, and there really isn't much to report, as I was just doing a 5K, but the Light House 5K went pretty well! I only managed to take one not-very-good picture of the starting line, because I realized that I had forgotten to charge my phone when I got there and it was almost dead, but the website has a lovely video that gives you an idea of the scenery. The half-marathoners had to run outside the park and then loop back in, but I got to spend the entire time on the park trails. They warned us that parts of the trail might be slippery due to moss, but I didn't have trouble (though I could see how someone actually running might need to be cautious). The trails are rather narrow which made things interesting a couple of times when I wanted to pass people who were walking two abreast, but everyone was generally very good about making way for the runners. When I got my race results I was originally confused as to how I'd entered a time warp, because the first message I got said that my time was 1h 22m, and I know I'm not THAT slow, even if I walk. It turned out the system forgot that I hadn't started at the same time as the half-marathoners, and my actual time was 40 minutes, which is about what I expected (and better than I've done before, so woo-hoo!). All in all it was a very pleasant day for a jog, and I'm glad I went! Thanks Elizabeth! We'll make a runner out of you yet!